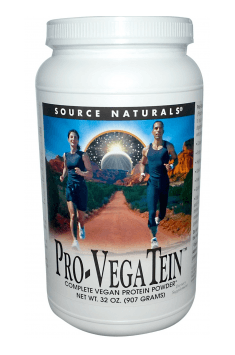 Source Naturals Pro-VegaTein is the highest-quality protein supplement produced on the basis of protein obtained from pea and rice. It is not only a great alternative to whey protein for vegetarians and vegans, but also an optimal choice for people who have problems with the digestion of proteins from milk sources. The product has been created taking care of maintaining the highest production standards, thanks to which, we have guarantee of zero content of animal products in the composition of the product. Thanks to this, it is appropriate for vegetarians and vegans. Moreover, the supplement is also free from gluten and soya, which is essential for people who don’t tolerate these ingredients. Apart from this, for the production of this supplement, no intermediate products produced with the use of GMO were used, thanks to which it is appropriate for people paying attention to the full naturalness of the products they eat. Obtaining proteins from peas and rice and taking care of the production conditions is not only important for people who don’t eat meat, but is also vital for people who deal with various allergies. Thanks to getting rid of the majority of the most popular allergens, the supplement is called hypoallergic. Importantly, we won’t find there even trace amounts of gluten, cereals, eggs, corn or soya, which is essential for people with advanced food intolerance. It is not easy to find such a protein supplement, due to the common production lines for many products in the same production plants dealing with supplements. The problem, with which the majority of vegans and vegetarians deal is incomplete amino acidic profile of products which are vegetable sources of protein. Therefore, it is important to supplement these deficiencies by people who don’t eat animal products. In this supplement we will find the full profile of all 20 protein amino acids. It has been obtained thanks to selecting high quality proteins from rice and pea in adequate proportions. Thanks to this, physiological role of protein coming from this supplement in the organism is maximized. The importance of proteins in a diet is especially appreciated by physically active people. Proteins provide amino acids, which are a basic building material in the organism of the human being. Increased supply of proteins in a diet of sportsmen allows to increase the efficiency of training by intensifying anabolic processes and stimulating regeneration. However, providing amino acids is also important for health due to other reasons. They constitute universal “bricks” allowing tissues to develop and regenerate. Proper supply of proteins in a diet does not only mean building efficiency of tissues, but also universal promotion of the organism’s functions. Amino acids are used, i.a. for the synthesis of some hormones and enzymes, condition proper efficiency of the immune response and also regulate water balance in the organism. Maintaining their appropriately high amounts in a diet, especially in the period of increased needs (induced by increased physical effort) is essential to maintain optimal health. To sum up, Source Nturals Pro-VegaTein is the highest-quality protein preparation addressed to the most demanding users. It is an easy and comfortable way to supplement protein both by vegans, vegetarians and allergic patients who cannot use standard protein supplements. Production safety ensured by a reputable producer guarantees that the supplement meets the most rigorous requirements placed by the users with special dietetic needs. Take two heaping tablespoons (about 18 g) daily. Mix with 6-8 ounces of water, milk, juice or any other beverage of choice. For best results, drink immediately. Can also be added to food for a protein boost. The product is characterized by a subtle, natural taste, thanks to which it may be used in various ways, as an additive to meals or an element of more complex dishes. The only thing that limits its utilization in the kitchen is our culinary imagination. The preparation should be used according to the individual needs for proteins in a diet. A synergistic combination of -Phenylethylamine and hordenine. Improves cognitive functions. 7-Keto® is a naturally occurring metabolite of DHEA found in the body.